Mauresmo first attained the top ranking on 13 September 2004, holding it for five weeks on that occasion. She was the fifteenth World No. 1 in women’s tennis since the computer rankings began. She is well known for her powerful one-handed backhand and strong net play. She officially announced her retirement from professional tennis on 3 December 2009, ending a career of fifteen years. She returned to Wimbledon in 2010, acting as a grass court advisor for Frenchman and 2007 Wimbledon doubles champion Michaël Llodra. She helped Marion Bartoli in 2013 and during Bartoli’s triumph at Wimbledon. Mauresmo has coached Andy Murray since June 2014. Amelie came out at the Australian Open in January 1999 at age 19. 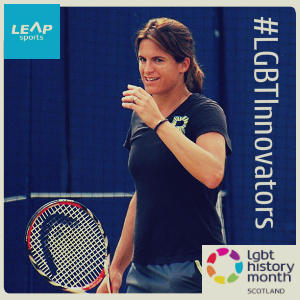 After a very successful Australian Open, beating top-ranked Lindsay Davenport, Mauresmo leapt into the arms of her then girlfriend and announced that her success had to do with finding love and coming to terms with her sexuality. In June 2014, Amelie Mauresmo began coaching Andy Murray, one of the top tennis players in the world. She is the first female to coach an elite male player- and that fact has not been without controversy. She coached Andy Murray all the way to the finals of the Men’s Australian Open, yet he felt he had to defend his choice in a coach. “A lot of people criticized me for working with her and I think so far this week we have showed women can be very good coaches as well,” Murray said as he played his way to the first Grand Slam final of 2015. Written on 17th February 2016.